Jake Moult’s stoppage time volley earned Altrincham a slender 2-1 advantage over Brackley Town heading into the second leg of the play-off semi-final. Brackley worked hard throughout the 90 minutes and looked to be heading for a deserved draw until Moult’s late strike undid all Brackley’s work. Earlier, Jefferson Louis had put Brackley ahead with a fine header before Simon Richman replied with an instant equaliser. The match looked to be heading for a fair draw but Moult popped up two minutes into injury time to drive a superb volley low into the bottom corner. Saints will undoubtedly be disappointed with the result but they can take plenty of positive into Saturday’s second leg at St James’ Park. Saints boss Jon Brady was without influential winger Tom Winters for the game and named Owen Story on the right side of midfield with Izak Reid left and Glenn Walker behind Marvin Robinson up front. Brackley remained assured, though, and continued to dominate the ball and came fractions away from taking the lead as Reid whipped a free-kick onto the post. Billy Turley then saved well from Richman’s curling effort but Saints responded through another Reid free-kick that sailed narrowly over. Then came Brackley’s best moment of the match as some neat link-up play saw Walker’s brilliant flick find Odhiambo clean through but Stuart Coburn denied the midfielder. A remarkable 30 seconds then followed as Altrincham hit the woodwork three times in a matter of seconds. First, Shaun Densmore’s free-kick rattled the crossbar and Gianluca Havern hit the post from the rebound before Duncan Watmore struck the post for a third time in 20 seconds. Immediately, Saints went straight up the other end and almost took the lead themselves but Odhiambo spurned a glorious chance from eight yards when well placed. The game eventually reached half time and, somehow, it remained goalless following a frantic and highly entertaining first half. After the break, Altrincham began well and enjoyed the majority of possession but Brackley remained solid and looked to get men forward at every opportunity. The home side hit the woodwork for a fourth time when Reeves hit the bar from Nicky Clee’s cross, and that was followed by another Reeves header that went narrowly over moments later. But then came the breakthrough and it was Saints who took the lead when, against the run of play, Story whipped in a pinpoint cross that was brilliantly headed into the corner by Louis. 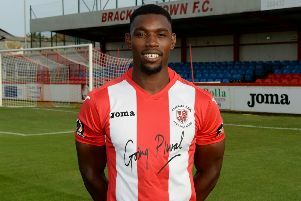 Having got a crucial advantage, Brackley now, understandably, got men behind the ball and looked to hold out for the win as Altrincham piled forward in search of an instant reply and they got it through Richman, who headed in Watmore’s cross. A tense final 10 minutes followed with Altrincham piling men forward in search of an advantage to take to St James’ Park while Brackley looked to hit the hosts on the break. But Altrincham secured a precious lead when, two minutes into the four added on, the ball dropped perfectly for Moult to smash into the corner, giving Turley no chance. It was a disappointing end to what was an enthralling game at Moss Lane, but despite the result, there’s still everything to play for at St James’ Park on Saturday. Altrincham: Coburn, Densmore (c), Doughty, Richman, Havern, Leather, Lawrie (Moult 74), Boshell (Lacey 78), Watmore (Brooke 84), Reeves, Clee. Subs not used: Hall, McMilan. Brackley: Turley (c), Clifton, Sharpe, Austin, McDonald (Nisevic 90), Story (Mulligan 78), Odhiambo, Solkhon, Walker, Reid, Robinson (Louis 54).